Watch Soul Singer, Nikki Laoye's Live acoustic performance of her hit ballad, Only You on popular Nigerian TV Show, TVC's Your View on Easter Monday (April 6th 2015). Nikki was accompanied by her close friend/co-writer of Only You, Nelson Jason Ekperi. The song has received many awards since its release in 2013 including the Headies 2013 award for "Best Female Vocal Performance"; 2014 Nigerian Music Video Award for "Best Alternative/Soft Rock Video"; 2014 Crystal Awards for Best Worship Song; 2014 Africa Gospel Music Awards in the UK - Best Female Artiste in Africa & 2014 AFRIMA Award for Best Female Artiste in African Inspirational Music. 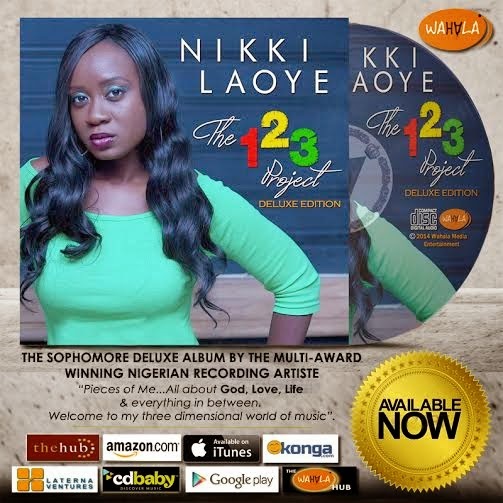 "The 123 Project" Album by Nikki Laoye is now available from Konga, iTunes, Amazon, The Hub Media Store(Palms Shopping Mall Lekki), Laterna Ventures (Victoria Island, Lagos), The Wahala Media Hub (47 Raymond Njoku street, Ikoyi), CDBaby.com, Google Play and other media stores. Forget it! THE GIRL CAN SAAAAAANG!!!! !